This little story today is all about organizational development but it will take me just a second to get to that but don’t allow me to distract you along the way. Look deep into my eyes — haha, Big Red Car, behave yourself. 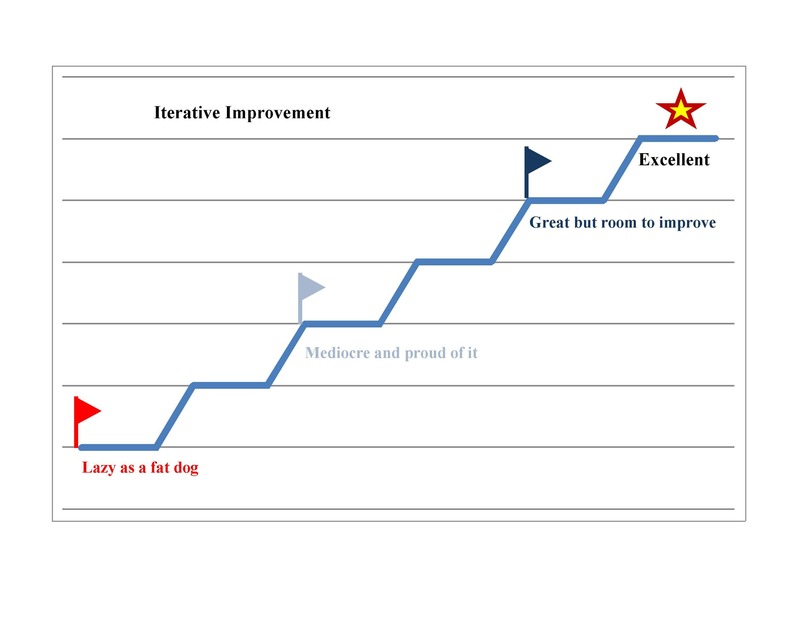 All improvement in everything in life and business is iterative. We have discussed that before. You begin to approach excellence in a series of iterative steps. Sometimes very small steps. Hell, then they move the goalposts and the process goes on forever. This is one pick up truck you are not ever going to catch. Not if you are really trying. The definition of excellence just keeps getting better and higher and bigger. Haha, Big Red Car, you crack yourself up, don’t you? Well, yes, I do. Anyway — you are going to be working to become excellent forever. You can deal with that, right? You really have no choice. So deal with it. Competition, the marketplace, technology — some force is going to move the goalposts. Just continue to pursue excellence and deal with it. When beginning this journey, you are going to have to make the first step and begin climbing the iterative curve toward excellence. This applies to everything about your business. Everything. Don’t be intimidated, just take that first step. Begin the journey by making a first — even unsteady — step but take that first step. Growing companies — the type that The Boss’s CEO friends are running — are going to have to develop their organizational structure to be able to pursue excellence and to nip at its heels in a changing environment. The organizational development of a company follows some other driver or metric — growing sales, increasing revenue. The organization — as a living, breathing organism that has to deliver the company’s products to its customers — has to be of the appropriate size, capabilities, skills, depth, breadth and talent to get the job done. A small company with $1MM in revenue and 2,000 customers requires a different organization than a $50MM company with 300,000 customers. Pretty obvious comparison, no? The organization chart is where you begin to initially assess this issue. You are looking for both a functional and structural organization chart — a simple line and box graphic. The basic functional subdivisions of responsibility will likely be leadership/management, operations, finance, marketing and technology. Oh, you can add functions such as “research and development” or “analytics” or “customer service” and other important disciplines that may be unique to your particular company but remember we are talking here about startups and small businesses not IBM. The founders are still turning on the lights in the morning and may be turning on the coffee pot to boot. The organizational structure is going to be — hopefully — a bit lean, nimble and agile. Someday it will become IBM but not right now. You can get drawn into debates about centralized v decentralized authority, divisional organization and regional/geographical organization but again, startups and small businesses. Customize the discussion and your organization chart as it pertains to your organization. Make an organization chart and commit it to print. This is your starting point. Now take a look at your vision and tell yourself where you will be in 3, 5, 10 years. This should be consistent with your vision statement in the Vision, Mission, Strategy, Values context. Where will you be and when? All this stuff works together and it is supposed to work that way. Try to define that “where” in the context of revenues, customer count and other parameters that will provide some real context to your deliberations. Also, profitability would not be a bad idea to consider as you have to be able to afford your organization some day. The notion of affordability of the size and complexity of your organization is an important consideration as you become a mature company. You will also grow the organization in an iterative manner. This is where the crawl, walk, run concept impacts your thinking. You will grow the organization in an iterative — crawl, walk, run — manner. We discussed this recently when we mused — The Musings of the Big Red Car, mind you — about how you could grow the financial capabilities of an organization. Do you remember this graphic? Click on the graphic and note how gradually the growing financial challenges of the organization are being met by the use of part time, full time and virtual talent — all at differing levels of expertise and experience. In this manner, the growing challenges and the growing organizational implications are synced. They grow together. This is the way your organization chart is going to grow also. How will you grow your marketing talent? In a similar manner. I am encouraging you not to go out and hire a Chief Marketing Officer when you are a fledgling little startup or a very small business. I am urging you to crawl, walk, run and hire a talented person to assist you with the marketing and not to try and hire the former CMO of Amazon to assist you just now. 1. Many of the “C” level positions in your company — COO, CFO, CMO, CTO, etc — are positions which might have been “co-founder” positions. They would have been your partners at the dawn of the company. But for whatever reason, they were not part of the founding effort. To bring on such a person after you have escaped the cradle and are trying out your legs is expensive to the founders in terms of equity and compensation. They also do not share the same searing founder Ramen Noodles experience. They are not wedded to the enterprise. It is not their baby. 2. Experience is a funny thing. You have heard me say — “nobody has 25 years of experience anymore, we all have one year of experience 25 times.” In this frame of mind, your company does not have the same needs as some other company which you are going to raid for talent. You may need to develop this talent because your requirements are truly unique. You may have to develop from within and train the top level talent you want. That is not to suggest that you start from scratch but rather you may be ill advised to try to fill the talent pool from the top and better served to allow it to bubble up from within. 3. The use of part time talent and interns and MBA students is a particularly fruitful way to develop talent in affordable and bite sized increments. This is particularly apt when the company is small and affordability is a very critical consideration. You are taking a “free trial” size approach to identifying and recruiting talent. 4. When you are the founding CEO, you may not really know enough about some of these disciplines to be able to identify and hire the right talent. Tough! It is difficult to know everything when you are a company founder. In about 30 years, you will have a lot of experience but you will still be learning how to identify the best talent. Sorry, they keep moving the goalposts on everything. But you will be more confident doing it. You can’t wait 30 years, so you will have to do the best you can. 5. Get a lot of advice on developing your organization. Talk to an adviser. Talk to your best Boardmembers. Talk to an experienced VC who has been down this road with some of his companies. Do not try to go it alone. Get some help. So now you have had a bit of direction on how to think through the problem. Now take up a pen and a huge piece of newsprint and begin to map out your organization over the next 10 years — 3. 5, 10 year increments. Chat it up with some good advisers after you have taken a stab at it. Correlate the growth of the organization with the attainment of our 3, 5, 10 visionary goals and constrain them with revenue, customer counts and other parametric considerations. Identify, by position and capability, the organization and talent you will require. Try to estimate the cost of the organization and see if you can keep the cost of the organization at some constant percentage of gross revenue, perhaps even a bit of a decline over time as your revenue begins to overwhelm the cost to create it as your company matures and grows. Overhead should be a declining percentage of gross revenue over time. Make it so and keep a weather eye on the cost of your overhead. Conduct this exercise as frequently as you consider adding capabilities and people to your organization. Perhaps every six months? This entry was posted in Brainstorming, Business, Organization and tagged crawl walk run, organization, organizational development. Bookmark the permalink. BRC/JLM – We are transitioning from crawl to walk and so I especially like your graphics on this. I’d love to see more of them, especially the financial type one, for other areas. Are they in the pipeline? Short answer — yes. Any particular area you are focused on right now? These are docs that I have had in existence, in some instances for decades, for a long time and have just recently adapted them to current times and the Internet age. Look at “free stuff” tab and take a look at the product development graphic. Today there is a sales process graphic. The Boss thinks graphically — the inner engineer being unleashed — and thinks that anything can be reduced to a process flow chart of some type. SOx 404 makes essentially the same argument. The big benefit of the process flow chart approach — the ability to find the choke points which derail progress and which do not advance the vision of the founder. I think best graphically as well. I recently honed the telling stories with merging datasets taking courses from Edward Tufte. We did the Lean Startup on Udacity for my ‘MBA on speed’ at CBS, and the hockey stick growth curve was a focus. 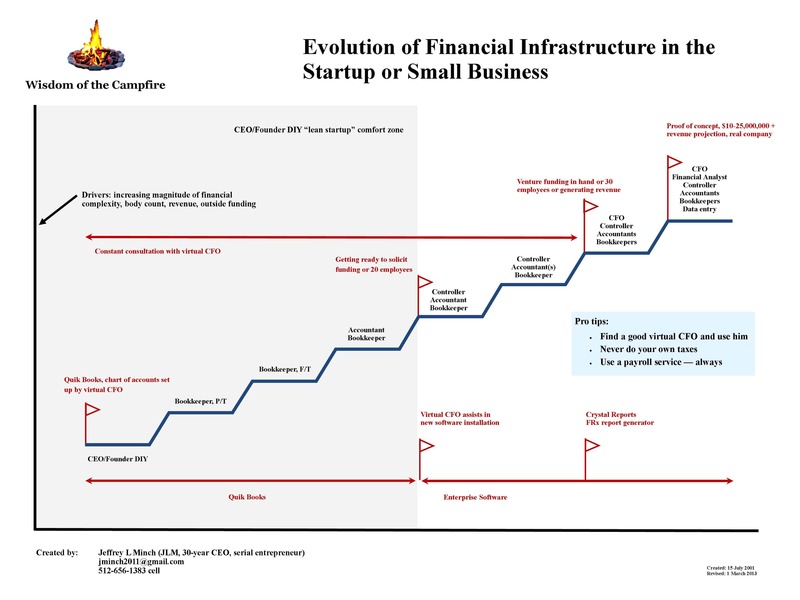 What I’d like to do is make layers of the growth curve, match it to a layer of your financial growth in your 2nd chart, and then put on a layer for organizational growth in the other areas, like team, and another for investment requirements and sales/customer milestones. Like a flip book of sorts, where each layer is transparent and can be overlaid on others to show how it all works. And as you mention, showing out choke points, or bottlenecks we face, with either funding or staffing to show our needs to investors shows what hurdles we have to make the hockey stick point north.. (Graduation day is pitch day end of May, and so we look to have this ready by then). This organized thinking — matching the organization chart to the current business profile and growth — is essential. I do not have such a graphic currently. Let me think about this a bit. I somehow feel that all the layers match in someway, or do a synced lag. Each layer should be able to be matched to another, across all sorts of departments, because they are the vital statistics or the living breathing company, just like one takes vitals on a person. ET has done some incredible mini graphics on this in the 90’s which we just discovered, while looking into medical applications for our platform. In our case, we have so many subject areas to apply our platform, hence different revenue models, that the need to make a consolidated flip book of growth is needed to show how each thing could come to pass as a spinoff of our core platform. Investors will invest in areas of interest to them, so when you can cover education, medical, and other consumer things, telling a really clear short story with data becomes essential to our presentation. All the more so since we sell a platform which is a graphically smarter way to learn.